Chance to get the stitching bug! BRISTOL Embroiderers’ Guild are celebrating this year’s National Stitch Day on August 6 with an insect stitching workshop at Bristol Museum. 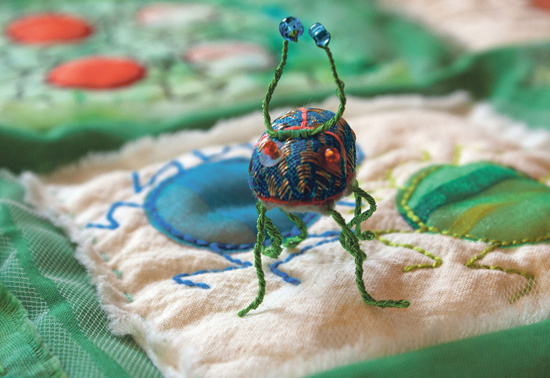 Guild members will be around with worked examples and a helping hand for adults and children making a stitched insect of their own using the Museum’s collection of bugs, beetles and butterflies as inspiration. Beautiful material and accessories such as buttons, beads and ribbons are all provided for embellishment. “There is a lot of textile art going on in the world that is different to the more intricate and fine embroidery work of previous years. When I was at school we were doing cross stitch and things like that whereas now, there are so many more fabrics available, with sparkles and threads, and all sorts of people do different things. Monthly ‘Meet and Stitch’ meetings are held at the Guide HQ on Westmoreland Road in Redland, plus evening meetings and lectures at All Saints Church on Pembroke Road. The Guild are also displaying work this summer at Lacock Abbey until October in conjunction with the National Trust’s Capability Brown series of events. A stitched exhibition, based around Fox Talbot’s contribution to photography can be seen in the tea rooms. All the items are mounted to look like they are in a photograph album and use the theme of the house and gardens.